“Everything was better in the 70s,” my 62 year-old father frequently reminds me, reminiscing about this time of better music, fashion, nightlife, politics and apparently even food! Being a Northerner, my dad has always loved a full English breakfast. Any meal is significantly improved, in his eyes, if accompanied by bread and butter. Recently however, our breakfast outings have stopped due to his dislike of contemporary breakfast menus. “Since when is avocado part of a full English breakfast? ?” he asks, sulking in one of the trendier cafes in the North Laine. Fair enough, I suppose. As much as I love crushed capers brushed onto sourdough bread (or whatever the latest vegan breakfast trend is) there are times when Brighton appears to have forgotten the joy of a real, gut bursting breakfast. 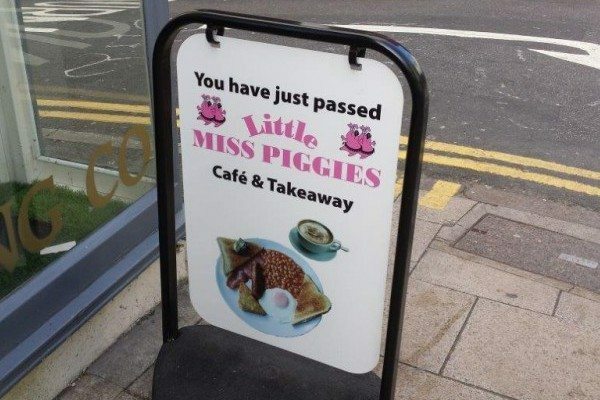 Little Miss Piggies café, however, is dedicated almost entirely to it. 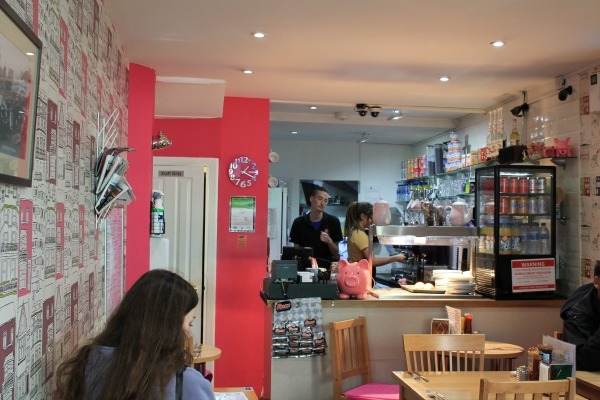 It is hard not to feel at home in this family-run café on 85 St James’ Street, Kemp Town. The smell of frying bacon and eggs fills the little space, making my mouth water the minute we walked in. We were greeted with a very warm welcome from one of the waiters and a friendly chat with another member of staff before being given the menu – a menu dad would have been very satisfied with. Little Miss Piggies specialises in traditional English Food, serving up all day breakfasts and brunches freshly made to order. 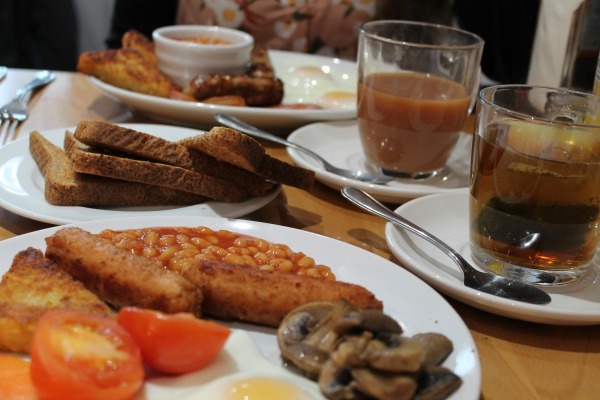 Even within this theme, my dining partner and I found it tough to make a decision with a huge range of variations on the traditional English breakfast, including the breakfast challenge of 3 bacon, 3 sausages, 3 fried eggs, 3 hash browns, and a double portion of baked beans for just under £10! Lighter breakfasts for smaller appetites (or Southerners) are served up daily including toasted muffins, croissants and granola with yoghurt and fruit. 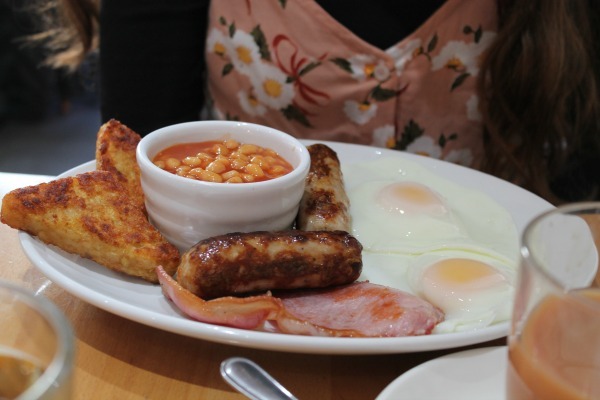 They also offer a very British brunch of bangers and mash and every variation of eggs you could ask for: from scrambled with salmon, to fried in an omlette with a choice of your filling. And there are a selection of less breakfasty items like toasties and baguettes plus a large drinks menu with teas, coffees (including a gingerbread latte), soft drinks and luxury hot chocolates. We ordered 2 teas, peppermint and regular English Breakfast whilst we mulled over the menu. In the end I opted for the vegetarian breakfast (sorry dad) and my partner chose the premium breakfast, with premium pork sausages. Miss Piggie’s also gives you a ‘build your own breakfast’ option – a pick and mix style scenario in which you can add to or take away from the printed options. So I un-veggied by veggie breakfast by asking for smoked salmon and my dining companion opted out of mushroom. This works well for fussy eaters but also broke, stingy students (me) as you can choose exactly what you are paying for. Not that this is an issue at Little Miss Piggies as no dish is priced above £10! Our plates arrived loaded with beans, mushrooms, tomato, eggs, sausages, and bacon, not to mention the extra toast they brought. My Linda McCartney sausages were cooked beautifully, with a slightly crispy fried outside and a juicy middle-just like real pork ones. The mushrooms and tomatoes were lovey and not too oily allowing the flavors of the veg to really come through and lending the food a cleaner taste, leaving us feeling satisfyingly full-and not too guilty. 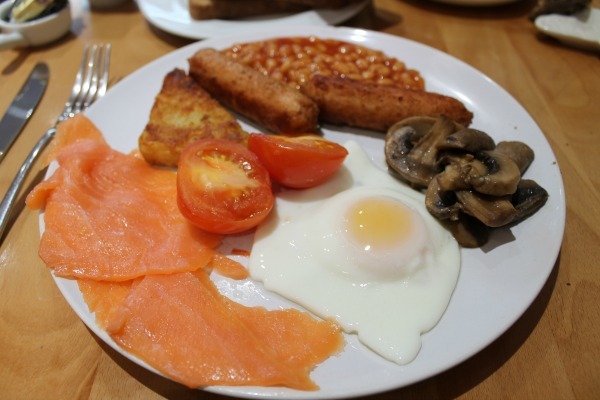 My smoked salmon too was so fresh and light, and I was glad I had been a little greedy and turned my veggie breakfast into a pescetarian one! 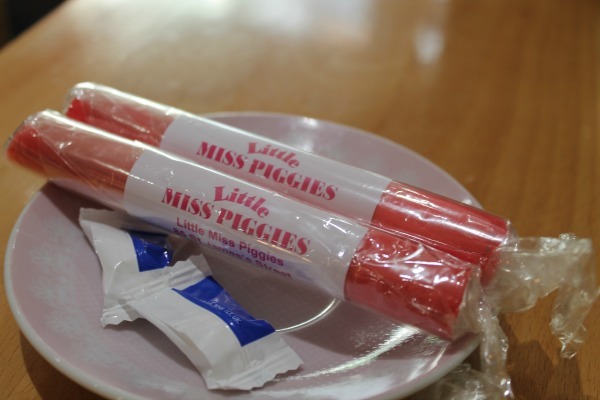 After we’d eaten, our waiter brought us a small plate of mints and some sticks of Little Miss Piggies very own Brighton Rock, a lovely, friendly gesture – a first after breakfast- and exactly what we needed after a big meal. Often, when I come home having spent my weeks allowance on brunch with a mate, my dad enjoys telling us that ‘back in the old days’ you could get a full English breakfast for only £4. Well now I can tell him these days (at least in Little Miss Piggies Café) it’s only £3.95!